I think that I am going to keep going and not just abandon it entirely. I had to go back to the beginning of why I originally started; I did so to keep a journal of sorts so I had my life somewhere so when I am old and gray, or older and reddish-brown as of late, that I could remember some of the things in my life. The fun, the quirky, the sad, the anxieties, the joys, the sorrows, and all the little pieces in between. 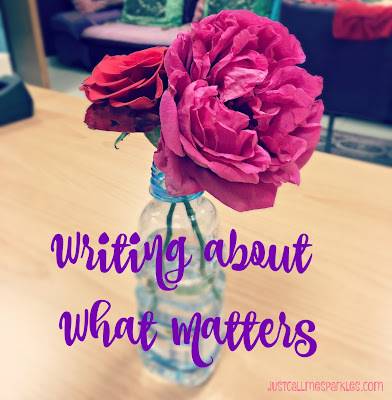 I have read on multiple blogs that you have to write what matters, what is important. I have to ask, what is important to whom? What matters to whom? I think I have been hard on myself for no reason. I like glitter, I like posting my favorite things on Friday, I love posting pictures of travel and my favorite make ups. That is what I like and what is important to me. I like to connect with people who are like minded and that I have a similar interest in things that I enjoy. So that is why that while it might not be the best blog, it might not win awards or show up in the top feeds of Bloglovin, but it is mine. I may go months without updating - we all know I am good for that. Yet I am happy to say this will always be my place. I am definitely not a quitter and besides, my blog design is just too cute to leave behind.